Alexander Litvinenko, the Russian ex-spy who said he was the victim of a poisoning, has died in hospital. Mr Litvinenko, 43, died on Thursday evening and the cause of his condition is still being investigated, said University College Hospital, London. Scotland Yard said officers were now investigating "an unexplained death". Friends say the former KGB agent was poisoned three weeks ago because of his criticism of the Russian government. The Kremlin has denied any involvement. Friend Andrei Nekrasov told the Associated Press agency Mr Litvinenko's wife Marina, father Walter and his 10-year son Anatoli were by his side when he died. Alex Goldfarb, speaking on behalf of Mr Litvinenko's family outside the hospital, said his death was a "terrible crime". 21 Nov - A toxicologist says he may have been poisoned with "radioactive thallium"
Mr Litvinenko had recently been investigating the murder of his friend, Russian journalist Anna Politkovskaya, another critic of the Putin government. Russian dissident Oleg Gordievsky, a former KGB colonel and friend of Mr Litvinenko, maintained that the poisoning had been the work of the Russians. The Russian security service had "sent a man with a poisonous pill to Britain", put a pill into Mr Litvinenko's tea and killed him, he told BBC News. Intelligence analyst Glenmore Trenear Harvey said Mr Litvinenko had "made a lot of enemies" when he had been tasked with fighting corruption during his time with the Federal Security Service (FSB) - the KGB's successor. Mr Harvey also said the poisoning could have been carried out by the "Russian mafia", made up of former-KGB men who had formed the group when the service broke up. "It's thought that many killings, both within the financial services industry in Russia and even within the media have been lain at the foot of this rather murky bunch," he told BBC News. "So I think that while one could say they were trained by the KGB this is not in any way a Russian intelligence service hit." Since Mr Litvinenko's death, both the Kremlin and Russia's foreign intelligence service, the SVR, have said they have nothing to add to their earlier denials of involvement. Before Mr Litvinenko's death, police said they suspected "deliberate poisoning" was behind his illness. Anti-terrorism police are heading up the investigation. Investigators have been examining two meetings he had on 1 November - one at a London hotel with a former KGB man and another man, and a later rendezvous with Italian security consultant Mario Scaramella at a sushi restaurant in London's West End. My sincere condolences go out to this poor man's family. I hope the truth about his death will one day be uncovered and shared with the world. 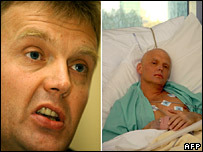 Mr Litvinenko, who was granted asylum in the UK in 2000 after complaining of persecution in Russia, fell ill later that day. In an interview with Friday's Telegraph newspaper, former KGB bodyguard Andrei Lugovoi said he had met Mr Litvinenko at the Millennium Hotel in Grosvenor Square but vigorously denied any involvement in the poisoning. Mr Scaramella, who is involved in an Italian parliamentary inquiry into Russian secret service activity, said he organised the meeting because he wanted to discuss an e-mail he had received. What caused Mr Litvinenko's illness and death is still unclear. Initial reports from UCH at the weekend that he had been poisoned by heavy metal thallium, or some form of radioactive material, have now been dismissed by head of critical care Dr Geoff Bellingan. Speaking in Friday's Times, film-maker Andrei Nekrasov said that, before he fell unconscious for the last time, his friend had told him: "I want to survive, just to show them. The bastards got me but they won't get everybody."